I love gingernuts but it is very hard to find a recipe that has that old fashioned gingernut taste. When you find it, it is pretty exciting. This recipe is excellent. The biscuits really taste like the gingernuts I remember from my childhood. The recipe is from HOMECOOKED Favourite recipes from Australian Kitchens. It is a book of contributions from home cooks sponsored by ABC Local Radio. The recipe for gingernuts was contributed by Miss Margaret Corfield from Brooweena, Queensland. The speil at the beginning of the recipe includes a note from Ms Corfield where she advises that her Nanna had made the recipe since 1934. If it is good enough for Nanna Corfield, then it is certainly good enough for me. Bake for 20 minutes at 160°C, then turn off the oven but leave the biscuits in for another half hour or so. This ensures they are nice and hard, just as a gingernut should be. 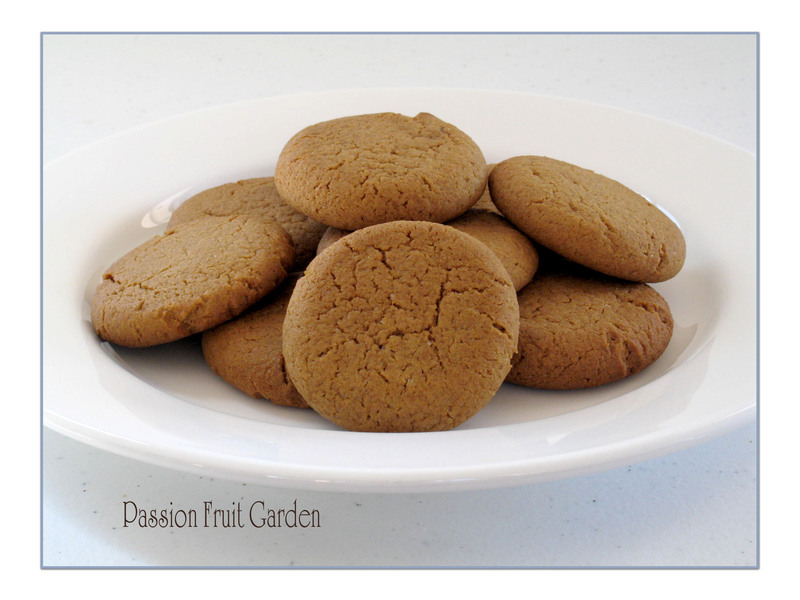 This entry was posted in Biscuits & Slices and tagged Old fashion gingernuts by Glenda. Bookmark the permalink. Thank you so much for the great recipe! I have been searching all over for a gingernuts recipe and this has the perfect taste- delicious! Mine were crunchy around the edges and slightly chewy in the middle, which was delish, but do you think I just need to cook them longer for them to be super crunchy? Sorry to take so long to get back to you. We have been away. Thanks for trying the recipe, it is a beauty. The gingernuts should be rock hard. If they were still a bit soft in the middle then they should be cooked a bit more. If they are beginning to colour too much then maybe you can turn the oven down a wee bit and cook them for longer. When you take them out of the oven they are soft but they harden up as they cool. If they don’t, just put them back in the oven again until you are sure they will be hard. Thanks again for reading my blog and trying the recipe. They should be VERY crunchy – they nearly break your teeth. I just pushed down a bit with the back of a spoon. Take them out of the oven when they are about the same colour as bought ones. Sounds like you took them out of the oven a little too soon. Thanks for playing. You will have to be quick, they are nearly all gone. Thanks Colette, great to see you on the weekend. More gingernuts next time, if you like. I can vouch for the gingernuts, they were excellent! A welcome treat on the long drive back to Perth.